The latest addition to the cyclone range, Cyclone AZ2000 is a high-performance cleaning gun with a TURBO motor. You can also adjust and control the power thanks to its rotary set. New Version Cyclone Car Cleaning Gun. Turbo-charged Cyclone for faster, more powerful cleaning! The Cyclone Turbo has newly developed rotational technology inside the funnel to provide faster, more powerful cleaning compared to the Cyclone Classic. Professional detailers will love the speed and effectiveness of the Cyclone Turbo. The new design reduces wear and ensures a longer life and superior performance. The Cyclone Blow Out Gun works with your air compressor to blow debris and moisture out of hard-to-reach areas of a vehicle. Use the Cyclone Air Blow Out Gun inside or outside the vehicle. The strong, tornado-like funnel of air blasts out dirt and dust quickly and easily. The Cyclone Air Blow Out Gun has the same cone shape as the Cyclone Car Cleaning Gun and Cyclone Air Foamer. The cone channels air into a powerful tornado-like motion that quickly lifts dirt and moisture from any surface. The cone covers a larger area than the air flow coming directly from an air compressor, yet it is still targeted enough to concentrate tremendous air power right where your vehicle needs it. The Cyclone Air Blow Out Gun has multiple detailing uses. Use it to blow crumbs, trash, and dust from under and between car seats. Blow out seams in the dashboard and trim, where dust accumulates. On the exterior, blow moisture out of door, trunk, and hood jambs. Blast water out of body seams and from around windows and mirrors to avoid drip marks. Under the hood, dry out the engine compartment so you can dress and polish engine components. The Cyclone Air Blow Out Gun speeds up detailing! The strong gust of air blows debris out in the open where you can vacuum it up. It blasts water out of crevices to eliminate time-consuming hand-drying. 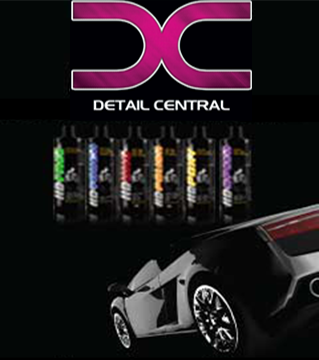 It dries up the engine so you can get on with your detail. The Tornador Air Blow Out Gun saves you valuable time! The Cyclone Air Blow Out Gun works with an air compressor operating between 60 and 90 psi.Depress the trigger to release a powerful gust of air. Because the Cyclone Air Blow Out Gun is designed to blow debris out of tight spaces, it is recommended that you wear appropriate eye and ear protection to avoid contact with loose debris. You can't clean what you can't see! The Cyclone Air Blow Out Gun removes debris from its hiding spots inside the car and aids you in drying the exterior and engine area. The powerful blast of air cleans and dries where you can't, to complete your detailing job faster. To clean the Cyclone Air Blow Out Gun, place the nozzle in a bucket of soapy water and depress the trigger once or twice to remove dirt from cone. A minimum of 90-liter compressor is required to operate the cleaning gun. Cyclone AZ2000 is a pneumatic gun that will allow you to efficiently clean the interior and exterior of a car. The power of its jet makes it possible to go in the places hard to reach. We advise against the use of the cyclone turbo gun on the roof flags or ceiling (risk of detachment). The gun is delivered with a 1/4 quick coupling. First, remove dirt (dust and other) with a vacuum cleaner. Then, turn the green valve to the horizontal position to engage the liquid (ready-to-use detergent) that you have put into the tank. Important: Hold the funnel at a distance of 1-3 cm from the surface to be cleaned at an angle of approximately 90 °. Press the "trigger" completely; Move the turbo cyclone slowly by forming circles on the surface to be cleaned. To adjust the speed, turn the cone according to the markings on the funnel. To remove any residual moisture, wipe with a clean, professional microfibre. To clean the funnel: Turn the green valve to the horizontal position on "air only", hold the cleaning nozzle in a bucket with clear water and press the trigger to remove the dirt from the " funnel. -Replace damaged, worn out parts immediately for your own safety. Pipes, funnels and seals are wear parts. -Rinse the hoses and the suction filter after each use. When the work is complete, always disconnect the tool from the compressed air supply, release pressure from the hose and disconnect the tool from the compressor before changing parts or repairing. Volume of air required: For the perfect deployment of the cyclone turbo AZ2000 power, a constant pressure between 5.0 and 8.0 bar is required. The constant air volumes vary according to the size of the compressor and its power. Always make sure the tank and air hoses are clean and free from dirt.